Still just a panic attack? I have been predicting higher interest rates, a stronger economy, and healthy returns in equities for a long time. For years I've gone against conventional wisdom, which typically worries that rising interest rates will choke off growth. Conventional wisdom, however, ignores an important detail: whether rising rates are the result of aggressive Fed tightening or not makes a big difference. Today's rising rates are not being driven by the Fed, since monetary policy is still relatively neutral. To date the Fed has been following the market, moving rates higher in baby steps. 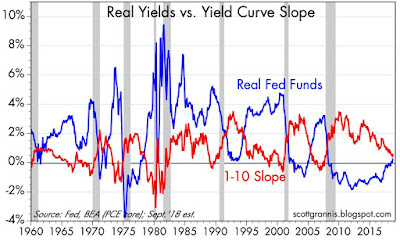 The real Fed funds rate is only marginally above zero, and neither the real nor the nominal yield curve is inverted. Liquidity is still abundant, to judge by the very low level of 2-yr swap spreads. Credit risk is relatively low, to judge by credit spreads. Financial conditions are optimal. Furthermore, regulatory burdens have declined significantly, as have tax burdens. What's not to like? 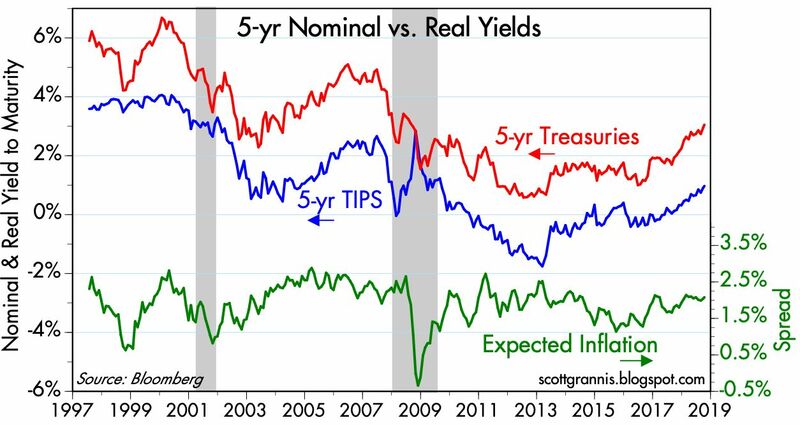 The higher rates we are seeing of late are being driven not by higher inflation expectations, but by higher real yields. This is healthy. A stronger economy goes hand in hand with higher real interest rates. A stronger economy is being built on a foundation of rising confidence and increased after-tax rewards to work and risk-taking. As I mentioned in a recent post, rising confidence is reducing the demand for money and safety, and that goes hand in hand with falling prices on safe TIPS and Treasuries and, ipso facto, higher yields. 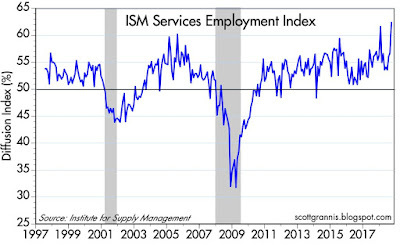 Today's September ISM surveys of the manufacturing and service sectors were undeniably strong. These surveys reflect fairly recent activity, and the results corroborate the solid numbers we have seen in regards to small business optimism, hiring plans, and jobs growth. 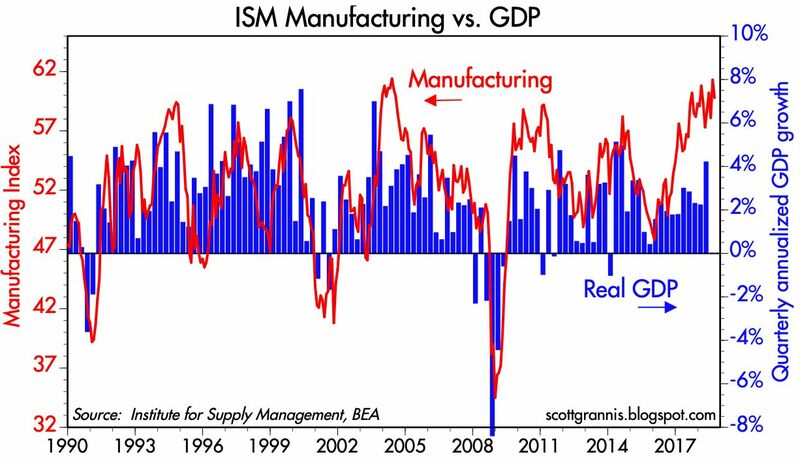 Chart #1 shows that the ISM survey of the manufacturing sector has done a pretty good job of tracking growth in the overall economy. Current survey levels are consistent with GDP growth of at least 4-5% in the current quarter. If this sort of growth persists for a few more quarters, the US economy will have left behind the "new normal" rate of growth of 2 - 2.5% that prevailed for the first 8 years of the current business cycle expansion. A return to more normal 3% growth trend (and quite possibly higher) seems almost assured at this point. Importantly, we are now on the cusp of having hard evidence that the Keynesian "stimulus" policies championed by Obama are inferior to the supply-side stimulus policies championed by Trump. Thanks to lower tax rates and reduced regulatory burdens, the private sector is blossoming, investing, and working harder. 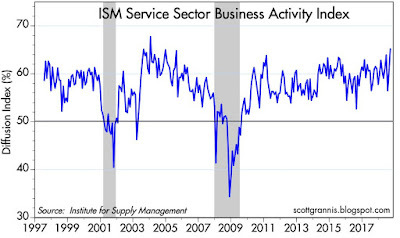 Chart #2 shows the ISM survey of service sector business activity. It's been volatile of late, but the September released was a blockbuster. 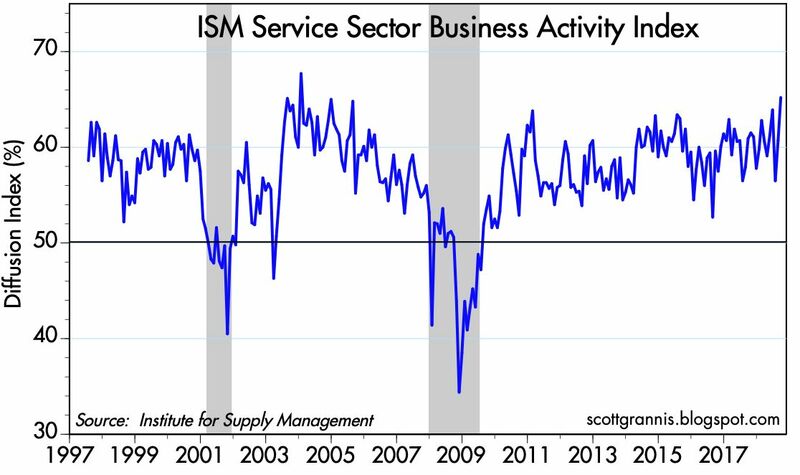 It's safe to say that business activity in the service sector (by far the largest sector of the economy, generating about 70% of total jobs) is picking up meaningfully. 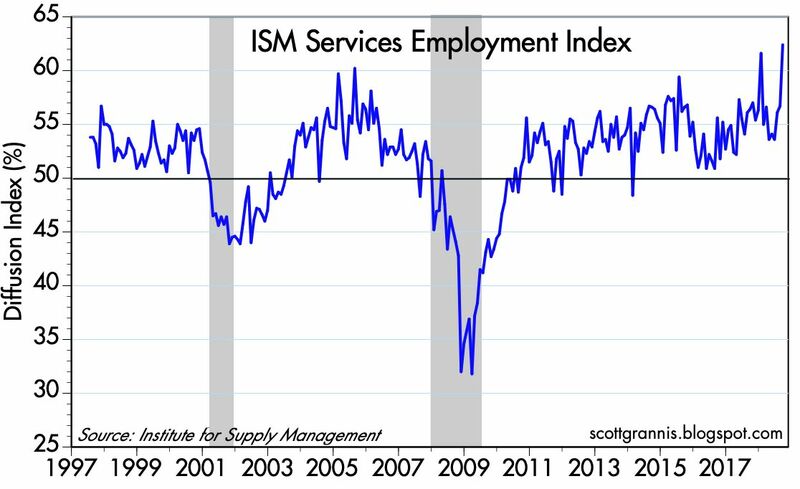 Chart #3 shows that the hiring plans for businesses in the service sector are robust—September's number was the strongest on record. 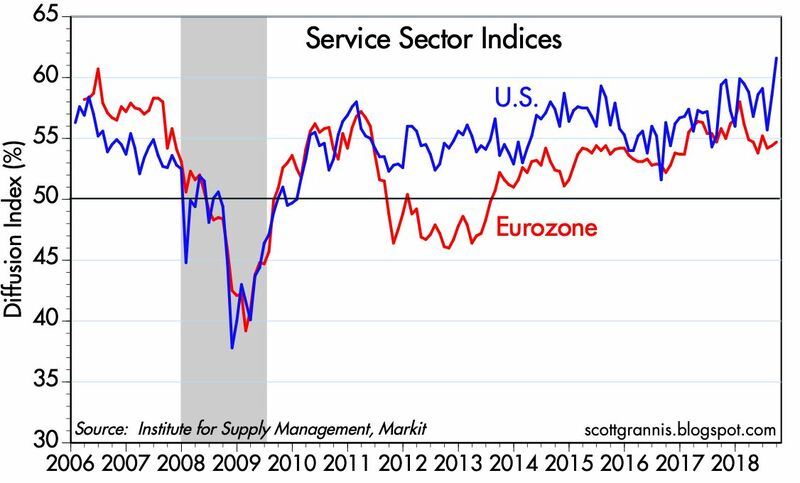 Chart #4 compares the service sectors in the U.S. and the Eurozone. 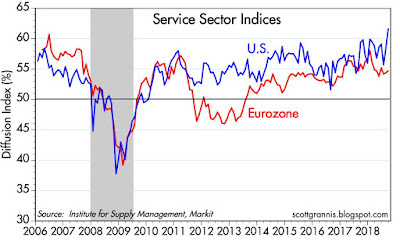 The Eurozone continues to lag conditions here, especially over the past year. That is likely the result of our tax cuts, strong corporate profits, a pickup in business investment, and sharply reduced regulatory burdens. In short, Trumponomics appears to be working, and in a big way. The Eurozone still suffers from "eurosclerosis." Chart #5 shows how real yields on 5-yr TIPS (Treasury Inflation-Protected Securities) tend to track the growth trend of real GDP. 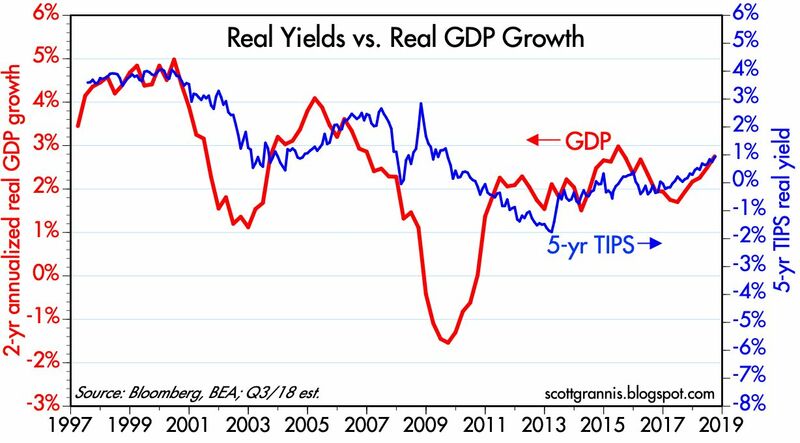 If GDP growth reaches 4% or so on a sustained basis, this chart suggests that real yields could rise significantly from current levels. 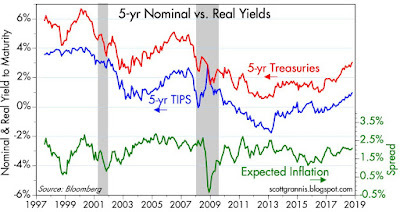 Nominal yields would not be far behind: a 2.5% real yield on 5-yr TIPS would be consistent, in a 2% inflation world, with 10-yr Treasury yields of 4-5%. Chart #6 compares the real and nominal yields on 5-yr Treasuries (blue and red lines), and the difference between the two (green line), which is the market's implied inflation expectation over the next 5 years. Inflation expectations remain anchored around 2%, which is exactly what the Fed is targeting. I worry that the Fed might be slow to raise rates in line with stronger growth expectations (which would allow inflation to pick up), but so far they seem to be doing a good job. 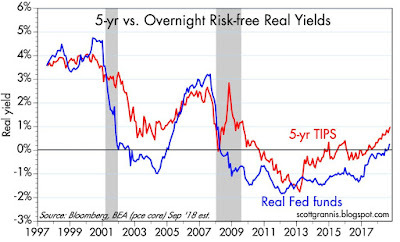 Chart #7 shows the overnight real Fed funds rate (blue) and the real yield on 5-yr TIPS. You can think of these two lines as a measure of the slope of the real yield curve from one day out to 5 years. 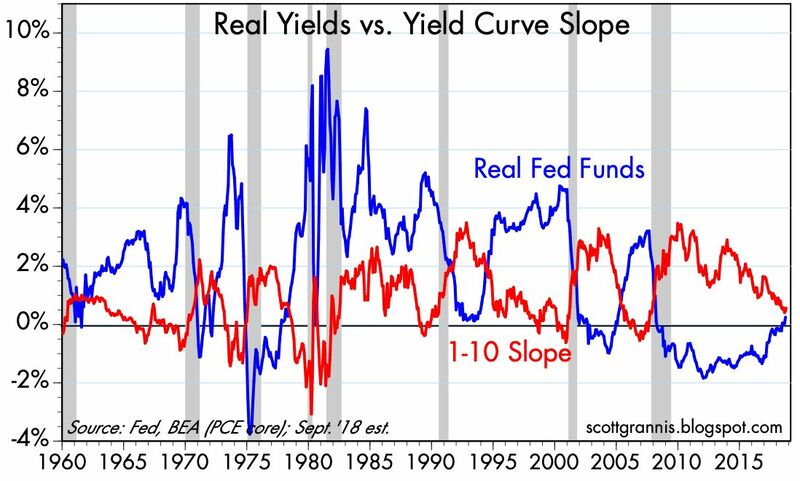 The time to worry is when the real yield curve becomes inverted (as it did prior to the last two recessions). For now the curve is positively-sloped, and that is normal. The real Fed funds rate is an important variable to track since it is the Fed's true target, and it best reflects how tight or loose monetary policy really is. Real yields are only just beginning to rise from zero. That is consistent with the Fed's stated desire to be relatively "neutral." Chart #8 compares the slope of the Treasury curve (from 1 to 10 years, shown in red) to the real Fed funds rate (blue). 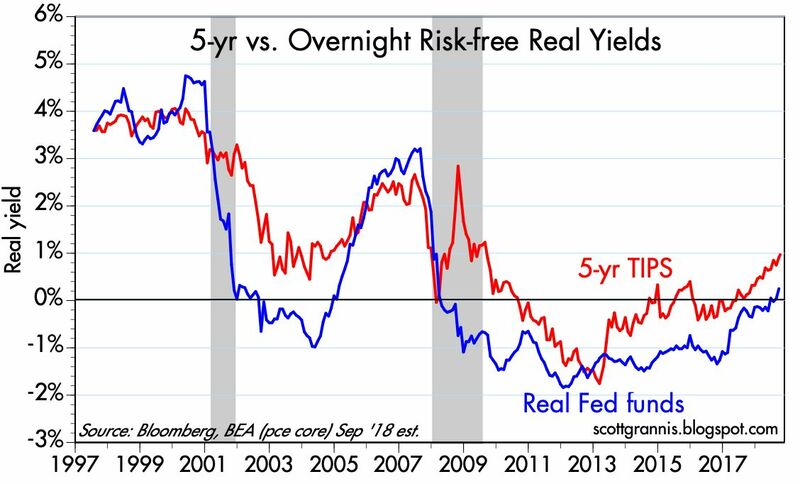 Recessions have always been preceded by a flat or inverted yield curve and very high real short-term yields. We're a long way from there still. 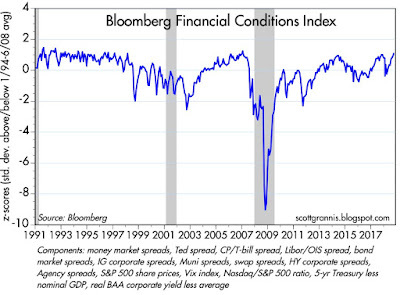 Chart #9 shows Bloomberg's Financial Conditions Index. 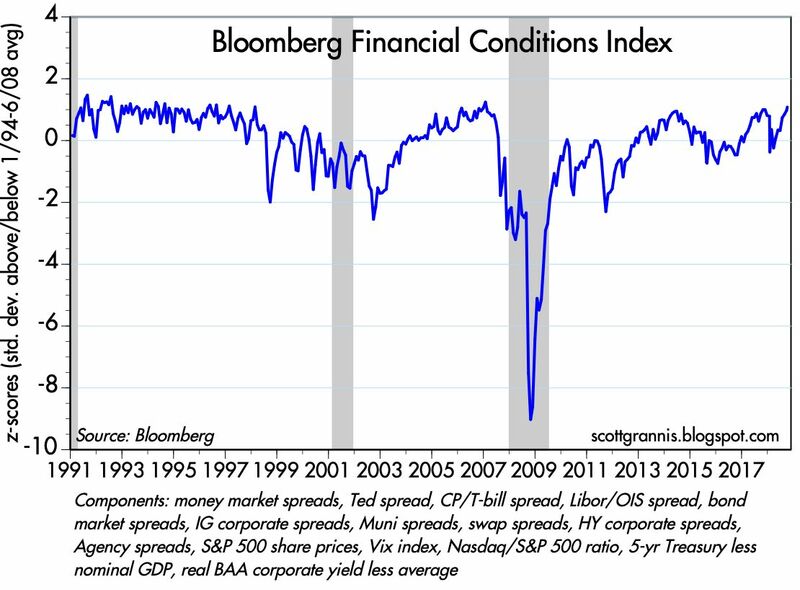 By this measure financial conditions are pretty much optimal. I note that 2-yr swap spreads are only 16 bps, which means that the market's appetite for risk is strong. 5-yr Credit Default Swap Spreads are around 60 bps, which is about what you would expect in a normal, healthy economy with a supportive financial backdrop. Thank you for your time and insight. I really appreciate your perspective. Scott, thank you for the great post. Great post. If there are any younger readers out there, let me tell you this, from experience: You can go through life being pessimistic or optimistic, and the latter will do you a whole lot more good and is more enjoyable. Sure, maybe you get caught with your pants down here or there, but you had fun along the way. As long as I am lecturing let me add this: One good deed is worth 1000 years of prayer. This writer is worried about a dollar shortage. He may be onto something, I do not see why the Fed has to reduce its balance sheet. Excellent observations. Lawlessness and risk aversion are declining. Federal government wind is at our backs, instead of having to plod into it. Trump-onomics is working. Voters have repudiated Obama-nomics. 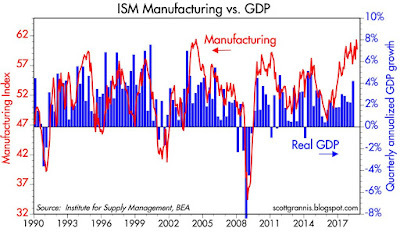 ISM surveys rocking while the canary in the coal mine (swap spreads) is singing beautifully. Yield curve still nicely sloped. Unemployment rates for the most marginalized people in society is at ALL TIME lows. Job openings at ALL TIME highs. Trade negotiations are moving toward favored US outcomes. 10 year nominal yield doubled, and is doubling again...because of prosperity. Airplane has been rolling down the runway for too many years....finally about to get in the air. Only threat to prosperity is if we return to the failed policies of the past. DEMs, profligate spending, and a stupid FED are the only threats to prosperity, at this point. So far, the FED is being smart. Cant say the same for the DEMs. Every one voted against Trump-onomics. Red Wave in November keeps the party going. Its a great time to be an American! I'm not surprised but we're about to add $1 trillion to the national debt in a year of robust GDP growth. As you point out, it's not a tax revenue problem. It's a spending problem and it can't be blamed solely on the Dems. Perhaps worse, a good majority of the spending is on auto pilot. Yeah, I'm kind with Matthew Grech here. The Federal deficit is soaring -- nobody seems to care anymore. Tax revenues are in free fall after the massive tax cuts (that were supposed to pay for themselves). BTW another reason that interest rates are rising is "crowding out effect from too much government debt. At the very least there is no clear link between economic growth and interest rates -- since the economy has been growing for some years now. But you don't have to agree with this. The solution is simple massive cut to social programs -- cut Medicare by 30%, Medicaid by 40%, Social Security by 40% and defense by 30%, problem solves -- trillions will be saved. These three (four) programs account for nearly 75% of all governmental spending. Not only is the federal government selling bonds, so is the Federal Reserve. $50 billion every month. Frozen....you said "Tax revenues are in free fall after the massive tax cuts (that were supposed to pay for themselves)." However, tax revenues for the first 6 months of 2018 are UP $76 billion over the same period a year earlier. That is an increase of 9%. Better profits and paychecks mean better tax revenues. And its barely had time to get started. We will get the 3Q tax receipts report in a week or so to see if the increase in tax revenue continues. Lots of taxes being paid Oct 15, too. Tax receipts in "real" dollars are actually down 0.4% (to August 2018) -- but also, there's growth and inflation out there...to the rate of 2.1% (inflation), so taxes should have "risen" by 2.1% just to take into account inflation, also additional economic activity (GDP growth 3.3%)should have resulted in higher tax receipts. In a growing economy with some level of inflation, this inflation has to be taken into account when calculating "true tax receipts". As an aside, and because of inflation (and other factors) the expense side of the equation has gone up by 7.5%. Government spending regardless of whether the money is borrowed or not is never a boost to the economy.Those resources must first be taken from the private sector and then spent with an eye on politics not economics. So there's been a 9% increase in federal income tax revenue for the first half of the year. Subtract out the inflation rate if you want to make it "real". 2% inflation rate for six months means 1% comes off that number. So "real" income tax receipts were up 8% for the first half of this year. That is very different than saying "tax revenues are in free fall". Even your calculation cant produce such a statement. Marcus: rather than tossing in these little bomblets you seem so fond of, why not share your considered view of the market, of the economy, or of some other facet of society? You seem to have such a high opinion of yourself yet you never put yourself on the line. I believe you’re something of an intellectual coward. Prove me wrong. Frozen makes a lot of sense to me. Unpaid tax cuts + huge increased defense and domestic spending in the last budget = blowing a hole in the deficit = pumping the economy at the end of the cycle = dumb! Who's going to pay for all this additional consumption? Americans ...? Ha ha. We're going to borrow it. More foreign borrowing = bigger trade deficits - despite Trump's new trade deals. Look at the latest trade deficit release - scary ! Is that really SO MUCH better?? PS for now I'm very positive on select stocks, and aggressively invested. No nervous Nellie or perma-bear here! Just a realist. Marcus: I rest my case. As Matthew Grech said. I rest my case, too! Federal income tax revenues up $76 billion for first 6 months of 2018 over first 6 months of 2017. Really you're going to cite a new article against the US Treasury numbers...that's your play. As your Dear Leader likes to say: "Fake News, fake news!" check that: JBD: get thee to a barber, then a tailor, then to the nunnery. also, how's the long qqq position doing now pangloss? MG: rest it right here. "Unless of course you are a bond investor, in which case you need to minimize your duration risk.)" Scott, since bonds are conventionally supposed to be the safe part of an investor's portfolio, do you think the current environment of a slowly bursting bond bubble turns conventional wisdom on its head ? Thanks. Re "do you think the current environment of a slowly bursting bond bubble turns conventional wisdom on its head?" Conventional wisdom has already been confounded. The problem with bonds over the past several years is that yields have been incredibly low relative to inflation. That left bonds with very little upside but lots of downside. Investors were willing to put up with this because risk aversion was very high. But risk aversion is ebbing, slowly being replaced by optimism, and that has rendered bonds less valuable. I don't think rates will stop rising until they become more competitive with the earnings yield on stocks. I can see the 10-yr going to at least 4% and probably 5%. "So where are we in terms of valuations now? For the US the blue dotted line shows the current value of Shiller's CAPE measure. It is still sky-high at 32 and not much closer to the median of 16.1. To get to that more typical long-term valuation US stocks would have to sell off by a further 49%. To trigger that kind of selloff markets would need incontrovertible evidence that the US economy is about to enter recession, or that US corporate earnings were entering a slump. The opposite is true, so this is not likely to be the Big One. But it is very clear that the decade-long upside for US stocks is limited from current valuations." Ps. Another pundit notes that in Q3 2018, "The S&P 500 gained 9%, and in August marked 3,453 days without a 20% correction; the longest recorded." When I look at the long-term stock market charts, they just seem to have gone to the moon .. doesn't this mean we are very likeky at the unsustainable peak right now, and it will need quite a lot of retracement in the immediate future? I am genuinely puzzled by the chart and high valuations on one hand, versus your much more optimistic view on the other. Thanks again.